this is by far the best use of smod i have seen. yeah, agreed. this game is over the top, gorey, action packed, non-frustrating fun! the original smod fell short by not having enough unique weapon variety and also by not manipulating the core gameplay enough, and smod tactical fell short by being WAAAAY too frustrating at certain parts with cheap deaths from enemies running around half a mile away from you who's one stray bullet from a friggin' SMG just happens to almost always hit you directly in the head! I remember when I messaged you a while back. You said that you needed to do a re-haul of the mod, I expected it to be only a bunch a of bug fixes, was I wrong! 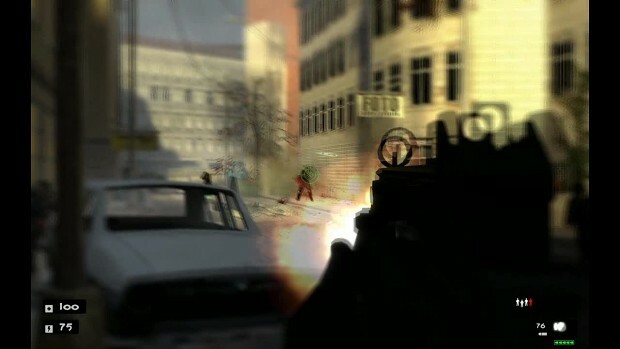 Even with the first release of SMOD: Outbreak there weren't any ironsights, but soon, someone on the forums made some for all the weapons, and pretty much everyone used them. Just look on the forums a few days after release, or maybe even on release, and you'll probably find some ironsights. beautiful amazing the action is amazing this is the best use of source i have ever seen! I love you. Not really that would be creepy. But seriously. You deserve like a private island or something.